They met in high school and years later, tied the knot. Ravi Sanchoo was 16 and Amanda Devi Ramnarain was 15 when they met in 2003 during high school. They dated for five years. Then, one fine day, Ravi went down on one knee and with a ring in his hands asked Amanda for marriage. Tears sparkled in her eyes out of joy. She couldn’t have said no. To her surprise, Ravi asked her parents’ consent to marry her the night before he proposed. The two were engaged for almost two years before they finally got married. Amanda says, “My mom did a better job than a consultant could have done.” However, wanting it all to be ‘just perfect’ was quite a stressful job, accepts the bride. The couple picked Orlando as the wedding venue because Amanda’s parents lived there. In a Hindu wedding, the wedding venue should be close to the bride’s parent’s house to manage various tasks related to wedding rituals. 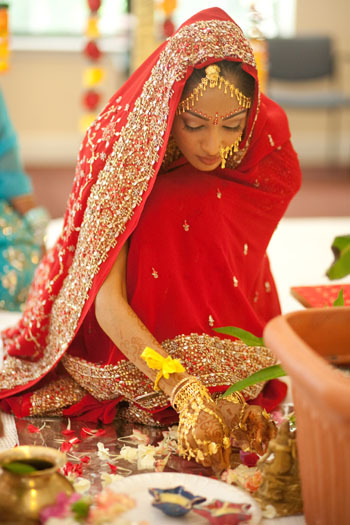 While the groom wore the traditional attire of his culture – a yellow jurajama for the wedding – the bride wore a beautiful red sari, along with matching jewelry. Amanda’s best friend Candis did her hair as an elegant bridal bun that went quite well with her traditional Indian bridal attire. Professionals from MAC were hired to do the makeup, which was perfect and amazing. The wedding ceremony took place at noon at the Shri Surya Narayan Mandir in Ocoee, Florida. Being a traditional Hindu wedding, the theme was red and orange. The beautiful mandap was decorated in yellow, red, and orange. The marriage was solemnized by Pundit Vishnu Ramnarine. The couple wanted to keep the wedding reception simple yet elegant. They chose a white and green theme. Amanda wore a stylish princess ball-gown with a fairly long trail and a sweetheart neckline. Candis made Amanda’s hair a bit more catchy and modern for this event and left some curls hanging from the sides. Ravi changed into a black tux with a green tie to match the reception color theme. The tables were decorated with white and green orchids. Placed around the flowers were champagne toasting glasses. The table linens were white as were the chair-covers with the sash around them being green. There was an open-bar with an impressive variety of liquors. The bartender served a special drink to the bride that was even named after her – The Amanda. The multi-cuisine dinner was just as scrumptious. 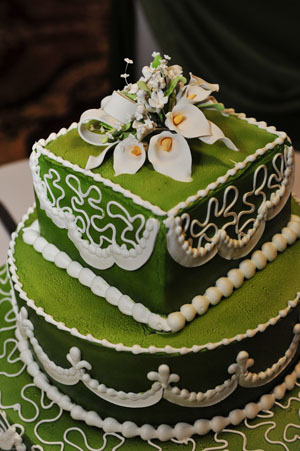 The three-tier wedding cake was all green with white swirls around it. The bottom-layer was chocolate, the middle was vanilla, and the top was marble. Emcee Paul and his DJ son played some amazing hip-hop, reggae, soca, chutney, and Indian numbers. The just-married couple opines that marriage is an occasion that ought to be cherished and enjoyed. “Don’t stress over little things. This is the most blessed day of your life. Enjoy each moment of your wedding,” says Amanda.